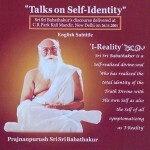 This is a series of spontaneous deliberations and exhaustive discourse of Prajnanpurush Sri Sri Babathakur on clear and direct knowledge of man’s true identity and real nature. In His own words—”The I-Reality or the Real Self without undergoing any change at all reveals as Universal-I. Universal-I reveals as numerous individual I’s and the entire world phenomena, which is nothing is nothing but the ‘Sportful dramatic sameside game of Self-Consciousness / I-Consciousness'”.